Hockey fans are on the edge of their seats watching NHL teams gliding through first two rounds and into the conference finals and playoffs of the 2014 Stanley Cup – commissioned in 1892, named for Lord Stanley of Preston, the then-Governor General of Canada – the championship trophy awarded annually to the National Hockey League winner at the conclusion of the finals. And just before the conclusion of hockey’s greatest competition, Brand Keys has released the results of their Sports Fan Loyalty Index for the most loyal fans in the NHL. Sure, winning is good, and winning a championship trophy is even better, but doing that alone doesn’t automatically skate a team to the top of the loyalty list. Winning gives fans bragging rights but there are other engagement values that have to be taken into account. And from a marketing perspective, loyalty – because it’s a leading-indicator of positive consumer behavior correlating, highly with viewership, licensed merchandise sales and, to a more-or-lesser, degree, attendance – represents the ultimate trophy a sports marketer can win. Win-loss ratios may be the only thing when it comes to making the playoffs, but as we’ve said again and again, when it comes to loyalty it’s not the only thing. Rule-of-thumb is that win-loss ratios can contribute up to a 20% bump in a team’s loyalty. But to be fair to the NHL fans, professional hockey is a little different from other Major League Sports. Winning games contribute a bit more to loyalty for hockey. About 10% more, for a number of reasons: first, the sport moves faster than the others, so there’s a bit more attention necessarily paid to the Pure Entertainment driver wherein wins and losses reside. For the NHL, the Authenticity driver correlates very highly to at-home attendance figures, and makes a slightly higher contribution to engagement and loyalty than it does for the NFL, MLB, or the NBA, probably because in recent years NHL TV access has been comparatively limited versus other Major League Sports. And while we’re sure hockey fans have their favorite players, the protective equipment makes it hard to instantaneously identify a player (with the possible exception of the goalie), so Fan Bonding makes a slightly smaller contribution in the case of this sport. How well a team does but, and a bit more important for hockey than other Major League Sports. But also contributing, how exciting is their play? How well they play as a team and do fans show up to root for the home team. Are there players that are particularly respected and admired? Is the team part of fans’ and community’s rituals, institutions and beliefs? Of the four Major League Sports that Brand Keys tracks in their Sports Fan Loyalty Index, the National Hockey League is #4 again this year. The National Football League is currently 1st followed by Major League Baseball, with the National Basketball Association in 3rd place. Overall team rankings – no matter which league – because they are based on predictive engagement metrics, and since rankings can be influenced depending upon how loyalty drivers are managed, it’s critical that NHL team marketers act as strategically off the ice as the players do on. Wayne Gretzky, aka “The Great One,” and leading point-scorer in NHL history, noted that a good hockey player plays where the puck is, and a great player plays to where the puck is going to be. Great sports marketers know that same maxim can be applied to fan loyalty too. Particularly if you have the right loyalty and engagement metrics in place. There’s Yiddish saying: “Being great at what a man does is a lot like shaving. No matter how good you shaved today, you have to do it again tomorrow.” And let’s face it, daily shaving for some men can be a ritual. For others, a requirement, and for still others a chore. But, according to our Customer Loyalty Engagement Index, when it comes to the shaving category, the highest expectation men have for a razor is “a really close shave.” OK, not a Boy’s Club or trade secret, we admit. Some things are what they are: primacy of product. The thing is, men’s expectations for this have not been generally met, which explains why men are willing to try a new razor every so often, figuring the razor brand has finally gotten it right, or at least closer to “right.” Manufacturers have responded to men’s search for “a really close shave” (and along the way some sense of brand differentiation) by innovating. This has mostly showed up by increasing the number of blades, although experts have indicated that after a while more than 3 blades becomes superfluous. And for those of you buying razor cartridges with more than 3 blades, that’s a great example of perception versus reality. But here’s some real reality: a razor with more blades usually costs more than one with fewer blades, and costs a lot more than really cheap razors à la online monthly subscriptions. While it’s undeniable that men have different shaving standards and razors have come a long way since the straight edge, from the safety razor to ones with up to 6 blades and a lubricating strip, men continue to look to innovation to help meet those expectations for a really close shave. And one brand – King of Shaves – has come up with something truly innovative. No, not another blade, or vibrating handle. Something called Hyperglide. It’s a razor that has a patented super-hydrophilic self-lubricating cartridge. The cartridge, which by the way, looks super-cool, creates a HydroGel on your face – wait for it – when it comes into contact with water. You don’t need foam or cream or gel, just plain H2O. The true innovation behind the lubricating cartridge on the Hyperglide is an ultra-thin polymer that is chemically-bonded to it and when it gets wet, it creates a lubrication layer with friction levels lower than that of Teflon. It’s a razor that creates its own lubricant. And when it does, it feels totally different than any razor you’ve ever used and gives you an incredibly close shave. Sure, lubricating strips have been around for a while, but because of some manufacturing magic King of Shaves came up with, you don’t have to worry about the strip peeling off or leaving residue or catching on your skin. The Hyperglide has a flexible head, so you can move your hand however you’ve become used to shaving, and you end up with that really close shave men have been expecting all these years. There’s an amazing ad for the Hyperglide entitled “Toothbrush” (you’ll see why) from Tiger’s Eye Advertising, masterminded and directed by one of London’s inspired creative directors, Tiger Savage, that puts all the scientific stuff into a kind-of real-world perspective, and we invite you to take a look. When it comes to market share of men’s razors and blades, Gillette (66%) and Schick-Wilkinson Sword (19%) have the lion’s share of the market and distribution in the United States. But you can find the Hyperglide at Target and online shopping platforms like drugstore.com. Is the battle of the beards over? Well, Americans spent close to $4 billion on razors, blades, and shaving accouterments for the year ending January 2014. That’s down about 2% from last year, as men have favored the Hollywood unshaven look, with some shifting to the online-only subscription services at much lower prices. But expectations for “a really close shave” continue to increase. While the Hyperglide feels like an iPhone moment in shaving, Gillette is preparing to roll out a razor called the ProGlide FlexBall. It apparently comes with a swiveling ball-socket handle that’s supposed to permit the blade to pivot and catch stray hairs in hard to get to places. You’ll end up paying a premium for the new hardware, but the new handle is supposed to help cut hairs shorter, miss 20% fewer hairs, and will work with current Fusion blades. 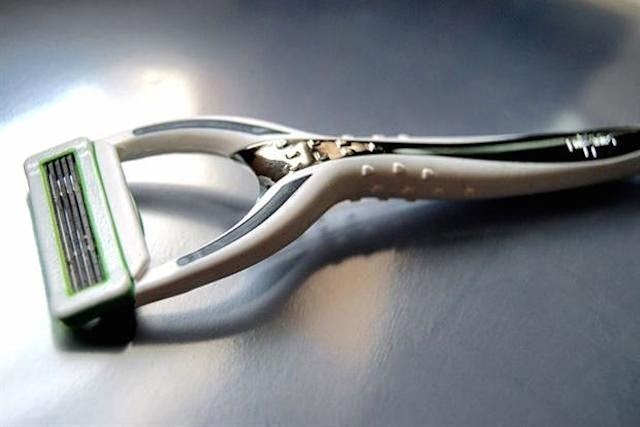 Gillette’s razors and blades generates about 9% of Procter & Gamble’s annual sales, and is one of their highest margin divisions, so they’re not giving up so easily. The new model is supposed to ship in time for Father’s Day. Pulitzer-prize winning humorist Dave Barry, once wrote “one day soon the Gillette company will announce the development of a razor that, thanks to a computer microchip, can actually travel ahead in time and shave beard hairs that don’t even exist yet.” Until then, give the King of Shaves’ Hyperglide a try. 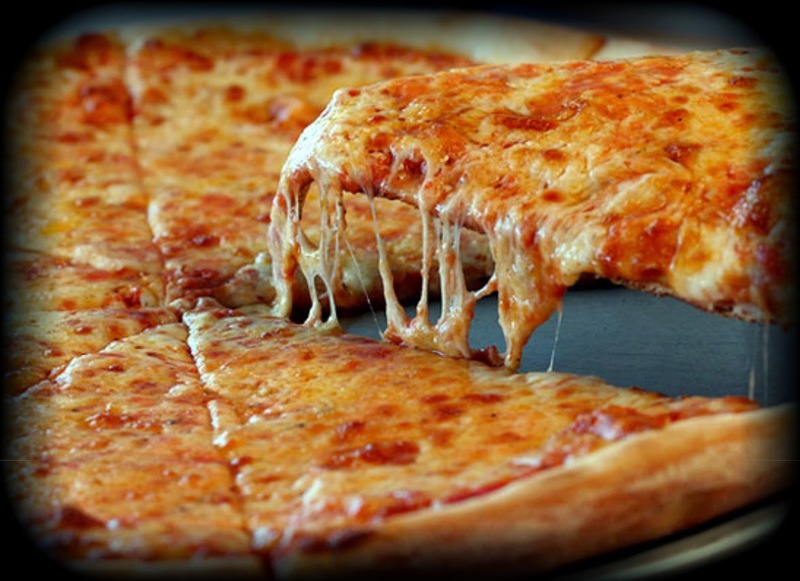 Your face (and your Father) will thank you. If They Don’t Get Your Name Right, Is It Good Advertising? Most of what Brand Keys looks to leverage for clients is emotional brand engagement and loyalty, since those metrics allow brands to measure real aspects of brand differentiation and meaningful brand strategy. We often assess creative, but given the granularity of today’s mediascape, it’s more important to get the strategy and brand-meaning right, hand off the ‘big idea’ and insights to inspired and imaginative creative professionals and let them “incase” it all with the kind of emotional and engaging creative they work so hard to produce. So in a recent update of the Airline Category in our Customer Loyalty Engagement Index (CLEI), we exposed some airline ads – just to see how well they flew for target consumers. To be clear, Brand Keys is a global research consultancy, and we don’t usually give away research findings for free. Sure, we match our predictive metrics and assessments to the demands of the marketplace, and often share insights with colleagues at national and international forums annually, but most of what we do is how we earn our living. That said, these recent findings – at least about one of the brands in particular – were just too good, and too much of a cautionary tale about navigating brand differentiation to put back into files and just chuckle over. 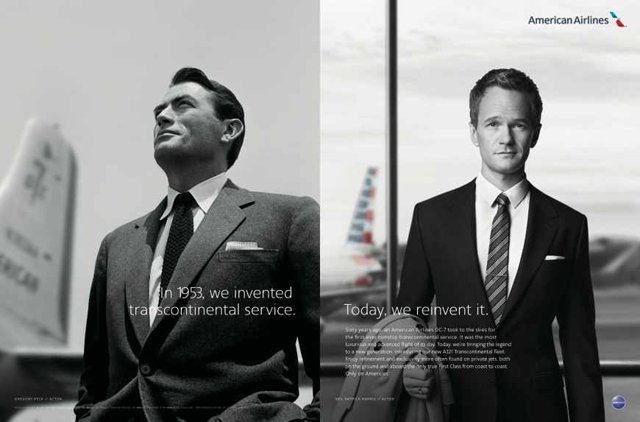 One of the ads we looked at was the relatively new American campaign that seeks to link elegant and iconic Gregory Peck and Grace Kelly, and the equally-elegant and iconic Neil Patrick Harris and Juliana Margulies, to the glory age of air travel. The print ads are black-and-white (with a bit of AA tail logo in color) and hearken back to another time; an age when men wore suits and ties, women wore hats, you walked across the tarmac to the outside staircase to board the plane. Drinks were served in crystal tumblers, smoking was permitted, and air travel was something special. Certainly not the cattle call, schlep-your-own-carry-on, here’s-a-warm-drink-in-a-plastic-cup most airline travel has turned into. And to a large degree, consumers felt that way about the ad’s gestalt. When we collected feelings and associations, the archetypes and symbolism consumers felt the ad captured and conveyed, we got lots of comments about “luxury,” and “how travel used to be,” “sophistication,” and “how air travel should be,” and “Donald Sutherland,” and “elegance” and “Gershwin/ Gershwin music/Rhapsody in Blue,” and “real service,” and. . . wait a second, “Donald Sutherland” and “Gershwin?” Where did that come from? It was a print ad, and neither Mr. Sutherland, the actor, nor George Gershwin the composer, appear anywhere in the airline ad. Well, not this airline ad, anyway. It turns out that Donald Sutherland does do the voiceovers for Delta Airlines. And “Rhapsody in Blue” is the theme music for United Airlines, but neither have anything to do with American Airlines, besides the fact that they’re competitive airlines. Sure, the American ad does an amazing job evoking the feel of an era and even a ‘voice’ of that era; unrushed, calm, experienced, pampered, and comforting. So is it great advertising and just OK branding? Is it wonderful creative, and not-so-wonderful advertising for creating a bond, an un-muddled association with the brand, or more appropriately, the right brand? Is it reasonable misattribution? Take a look at the ad and you be the judge. We will say that brand differentiation has indeed gotten more and more difficult in most categories, and many ad and marketing efforts end up getting a message right, or an entertaining creative execution out there, but also, sometimes, something that does not accelerate engagement for the brand. Keep in mind this is American Airlines we’re talking about, not some tiny brand consumers have never heard of before. Shouldn’t what they stand for stand a little clearer in the minds of consumers? But after years of creating metrics that operate under the consumer’s rational radar, to identify what they “think” as opposed to what they “say they think,” we feel confident saying that confusion is one of the most honest responses you can get. But confusing one brand with another via a tone, manner, and creative execution, is not something that ever shows up in a creative brief. According to 5,000 men and women in our annual Brand Keys Mother’s Day survey, “tradition” is the watchword again this year when it comes to gifts for Mother’s Day. With nine out of 10 consumers planning to celebrate, total spending is estimated be up 7½ percent over last year. A broader spectrum of relationships and changing family dynamics have turned the celebration – embracing step-moms, relatives, friends, and divorced and single-parent households – into a universal holiday that crosses all ethnic, cultural, and religious boundaries and portends a $19 billion windfall for retail, restaurants, and service providers The average spend? For men, who always spend a little more, $184.00, and for women, a little less, $153.00. They’re all buying more traditional gifts like brunch/dinner, flowers, spa services, jewelry, and clothing, all part of a continuing trend Brand Keys identified 3 years ago. No matter how much you love Mom, the reality is she doesn’t need a new tablet or smartphone every year, no matter how much tech brands wish it so. Like other gift-buying holidays, consumers (25%) are waiting for the last minute to make purchases when they believe the best deals will be available. Sure, it’s Mom we’re talking about, but over the past decade retailers have taught consumers if they wait long enough, eventually there’s a deal to be had. 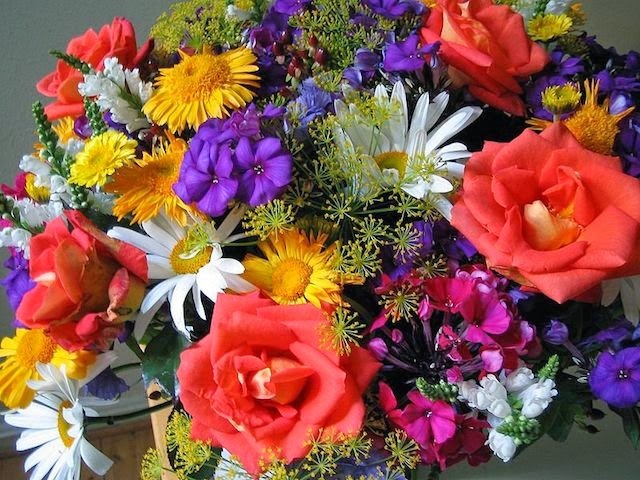 There’s a saying that “a Mother’s love grows by giving.” This year Mother’s Day celebrations and giving will be growing too. Just a little more traditionally.